I threw this together last night, and it ended up being one of my favorite meals I’ve made in a while! Chili paste can be intimidating if you’ve never cooked with it before, but it’s super good when tossed with roasted or sautéed veggies, etc. 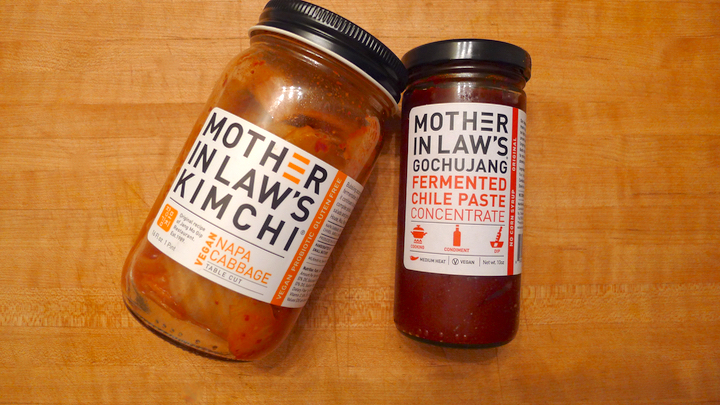 It can be strong and a bit spicy (which I love) but you can just start small and add more as you go. 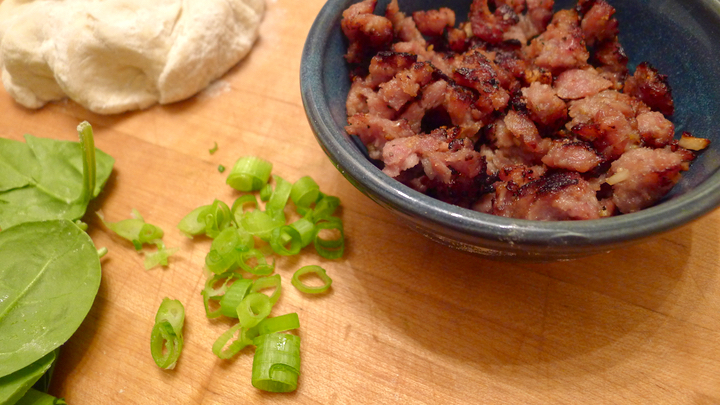 I love to eat it with rice to help balance out the stronger flavors a little. 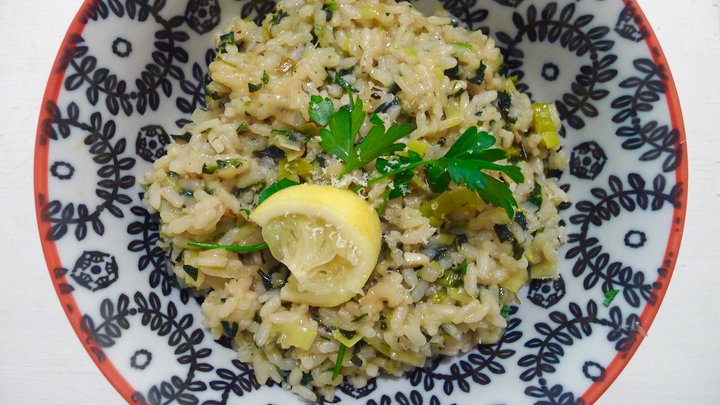 For this recipe I used cauliflower “rice” which is my new favorite staple item to have in my fridge. 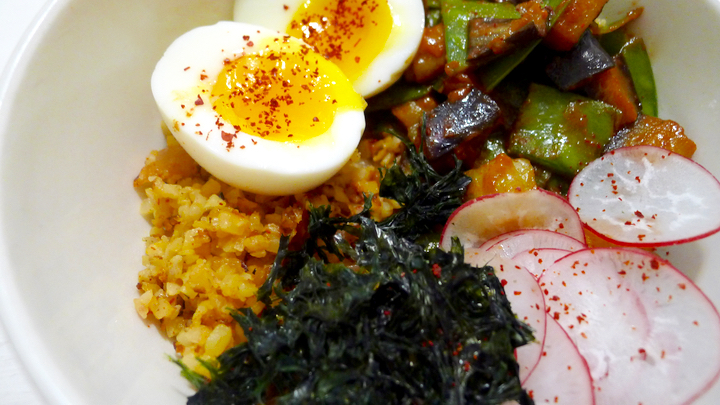 I topped it with a couple of my other favorite things, like radishes, seaweed, and a soft boiled egg. Happiness in a bowl! 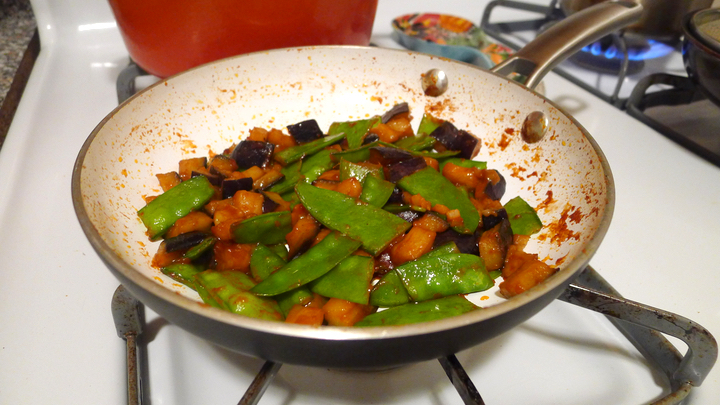 Start by sautéing the eggplant and sugar snap peas over medium heat with a little olive oil, salt, and pepper. 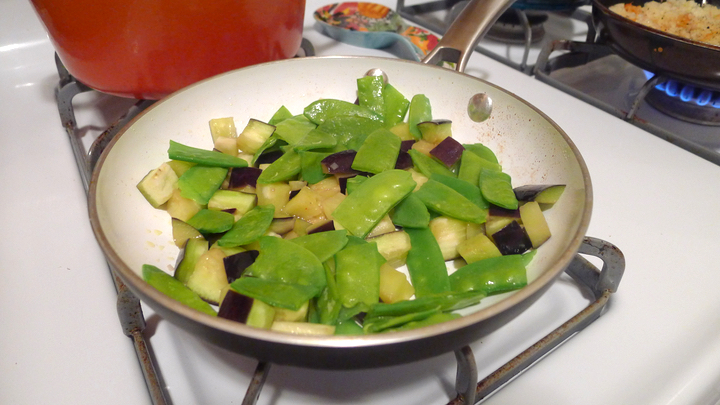 Cook until the eggplant is softened. I ended up adding a dash of water to the pan and put the lid on, to help steam it a little more. 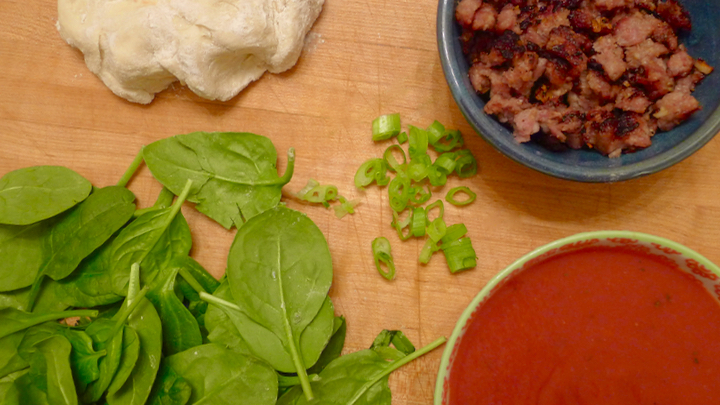 Once softened, add the gochujang paste and toss until evenly coated. 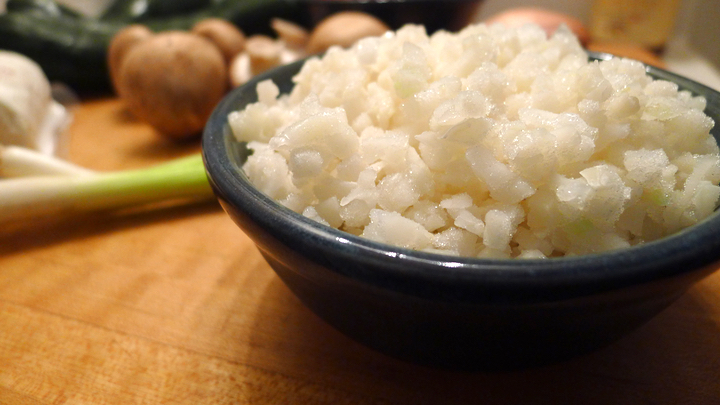 For the cauliflower “rice,” you can either buy this already made (Whole Foods has fresh and frozen options) or you can make it yourself by simply pulsing regular cauliflower florets in your food processor until it resembles a rice texture. Start by sautéing the shallot and kimchi together over medium heat with a tiny bit of olive oil, cooking about 1-2 minutes until softened. Add the cauliflower rice and some fresh pepper (I skipped the salt seeing the kimchi is a little salty) and cook about 5-7 more minutes until the cauliflower is cooked through. Lastly, cook your egg! To make a soft boiled egg (whites cooked with the yolk a little) boil a pot of water, gently add the egg, and let it cook for 7 minutes. Remove and run under cold water. Gently crack the egg and peel the shell. 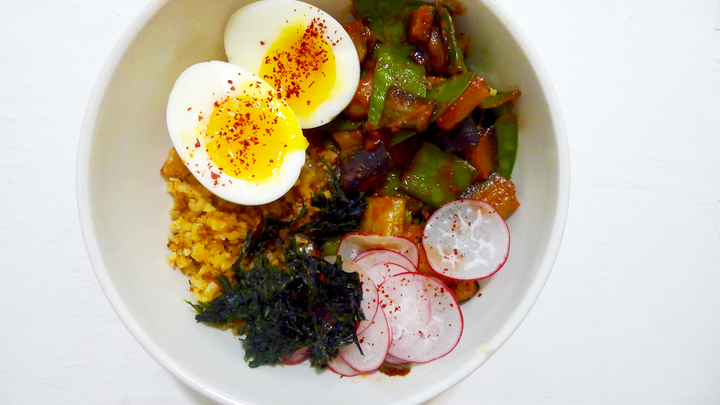 To assemble your amazing dinner, place the cauliflower rice in a bowl, then arrange the eggplant, sliced radishes, and seaweed on top. Add the egg and slice it down the center. Top with a sprinkle of the chili flakes. ENJOY! Preheat oven to 475 degrees. That might sound higher than the usual 350 you cook things at, but you want the oven to be HOT when cooking a pizza so the magic can happen. If you’re using a pizza stone, place it in the oven now while it heats. If you’re not using a pizza stone, then line a baking sheet with parchment paper. 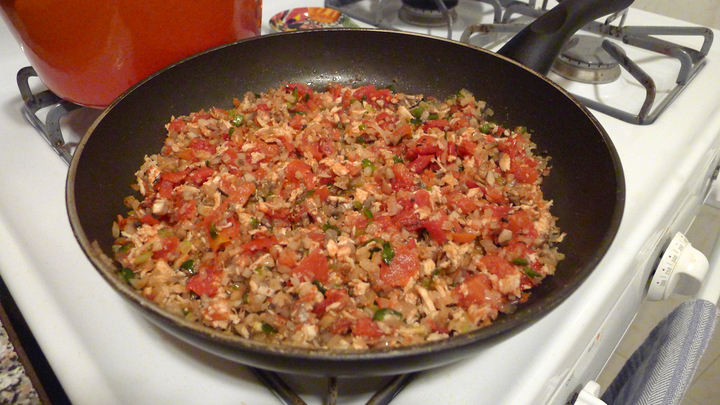 In a bowl, mix together the tomato sauce, red pepper flakes, basil, salt and pepper. Set aside. 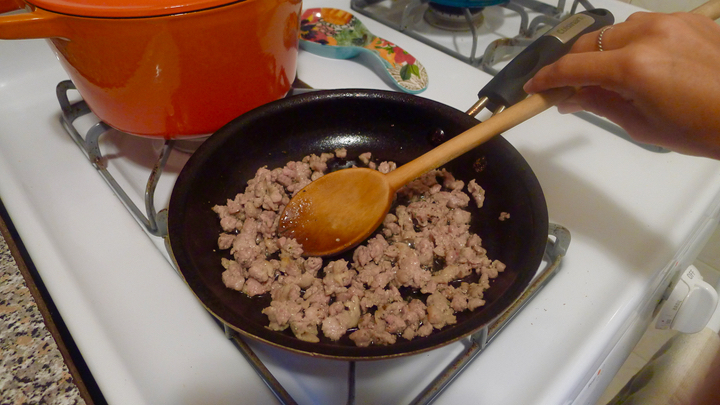 In a small pan, break up the sausage into smaller chunks with a wooden spoon, and cook thoroughly. Add the garlic and cook until softened. Set aside. 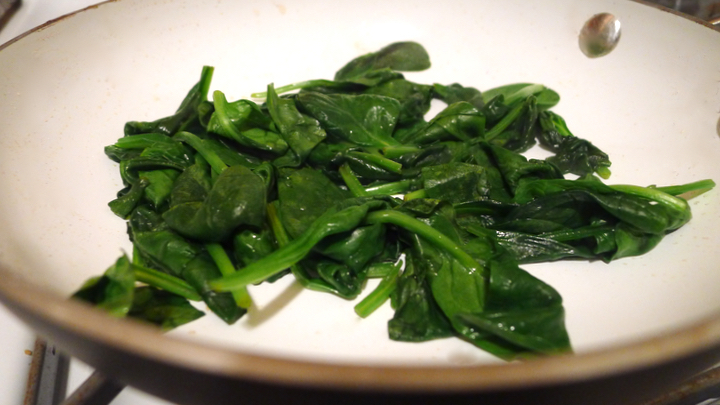 In the same pan, sauté the spinach until wilted. Flour a clean flat surface, and roll out the dough. I have trouble transferring the dough to the pizza stone once I add all the toppings, so I cheat a little and add the dough to my pizza stone first then quickly add the toppings following that. When you remove the pizza stone from the oven it’ll be VERY hot, so be careful, and don’t put it on any surfaces that will be affected by the high heat. I usually place mine on top of my gas stove or on a trivet. If you are not using a pizza stone, then place your rolled out dough on a baking sheet lined with parchment paper and add the toppings from there. 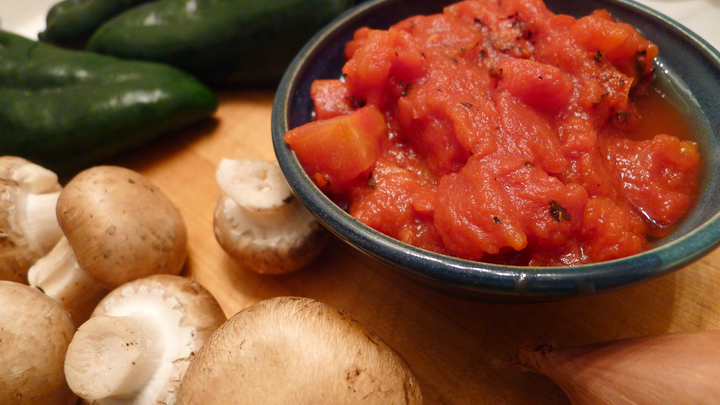 Start with spreading the tomato sauce, leaving a 1 inch boarder around the edges. 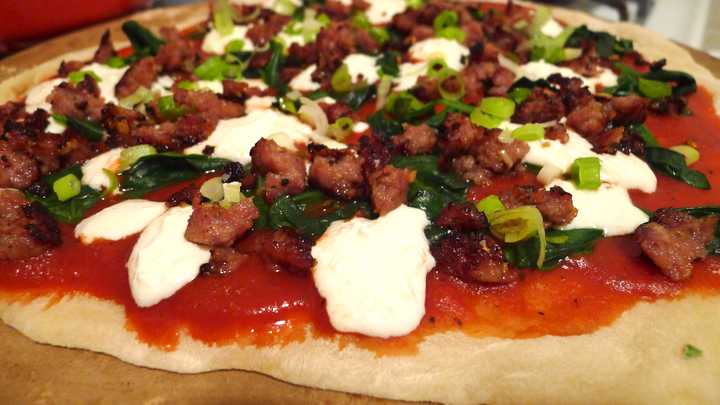 Add the crumbled sausage, spinach, green onion, and dollops of ricotta cheese. Place in oven and cook for 15 minutes, or until the crust is golden and the toppings are bubbling. Let cool a few minutes before digging in! 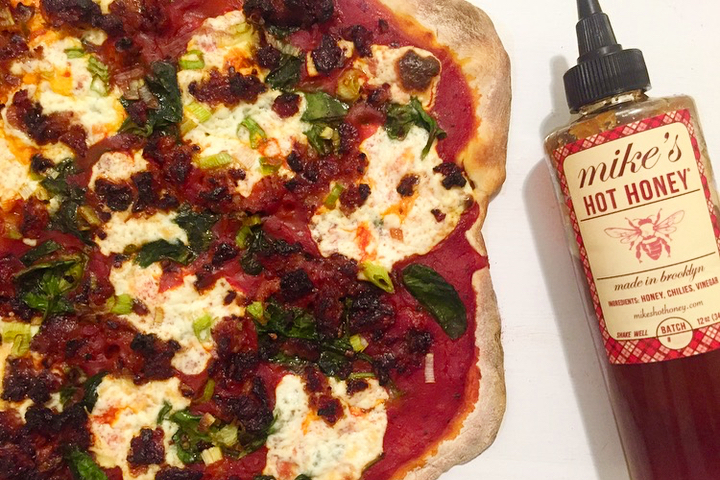 I love to top my pizza with Mike’s Hot Honey… it’s amazing and I recommend it on everything!! I’ve been so busy lately and haven’t really been able to post anything! I am off to Chile next week for two weeks, but when I get back I plan to jump back in and start cooking up a storm again! 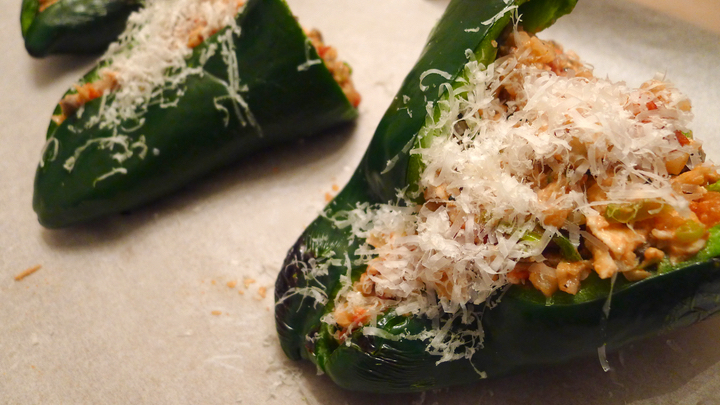 I made these stuffed poblano peppers recently and absolutely loved them. 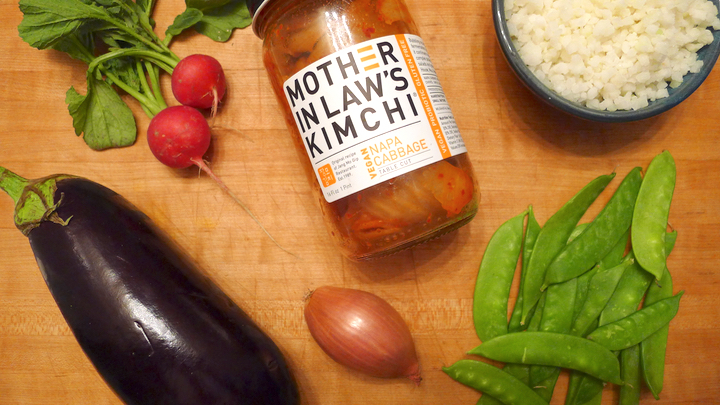 I bought the peppers knowing I wanted to make something with them, then sort of came up with this recipe after seeing what I had in the fridge that night. 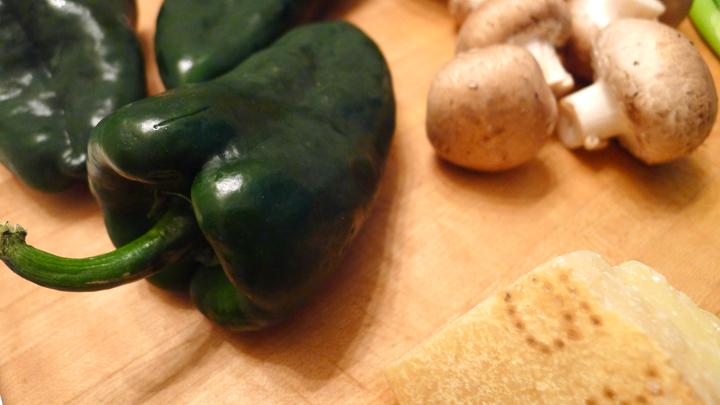 Sometimes the best recipes come out of already existing ingredients around the kitchen. 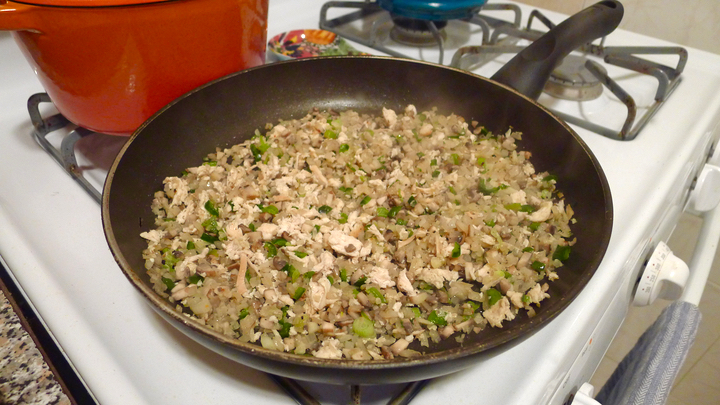 I charred the peppers over my gas stove, then stuffed them with a spicy cauliflower “rice” and chicken mixture. And cheese of course, because what would any meal be without cheese? This is an easy recipe that I will definitely be making again! 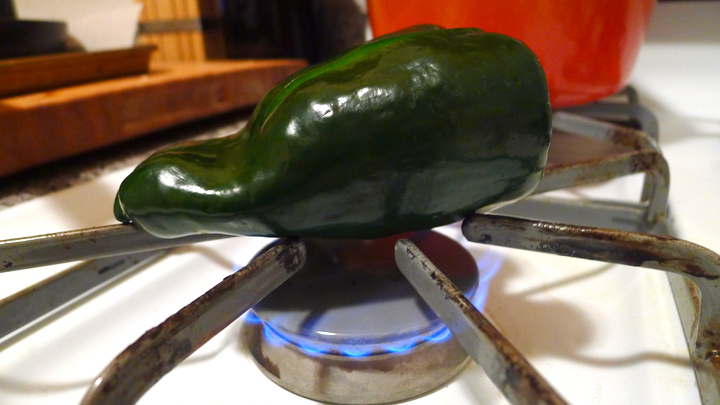 Start by charring the peppers. Cut the tops off the peppers and scoop out the seeds. I cooked mine over the gas stove, turning occasionally until each side have bits of char on them. Set aside to cool. I sliced one side part way open to make it easier to fill the peppers. Next, salt and pepper the chicken well, then sauté in a little olive oil until cooked thoroughly. Let cool, then shred the chicken. I like to do this with two forks – one holding the chicken in place and the other to shred. Set aside. 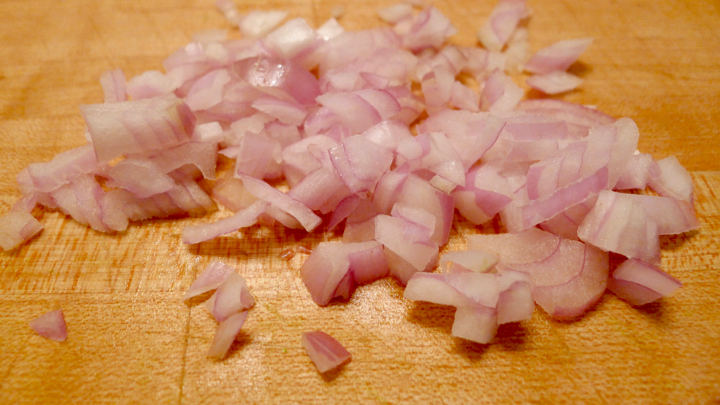 In the same skillet, sauté the garlic and shallot together until translucent. Add the green onion and mushrooms and cook for another minute or so. 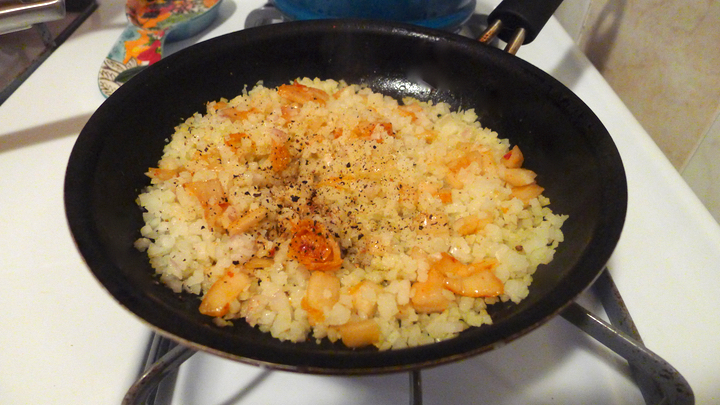 Add the cauliflower, red pepper flakes, paprika, salt and pepper, and cook for 5 minutes. 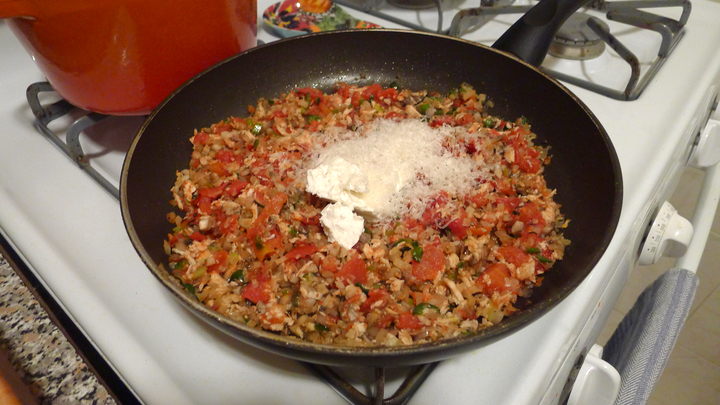 Lastly, add the diced tomatoes and the shredded chicken, and simmer for 2-3 more minutes. 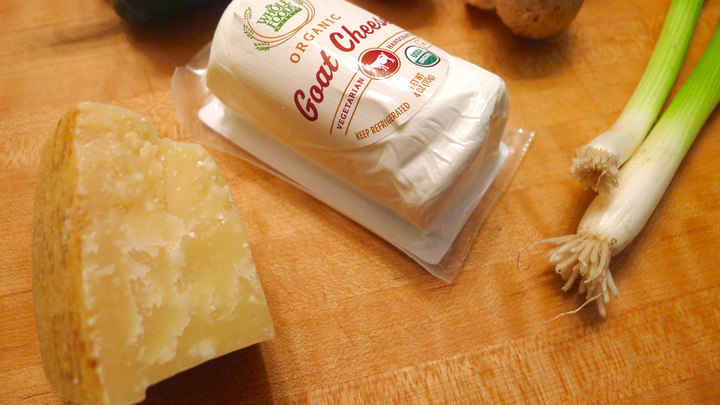 Mix in the goat cheese and Parmesan cheese. Stuff each pepper with the mixture, then place on a baking sheet lined with parchment paper. 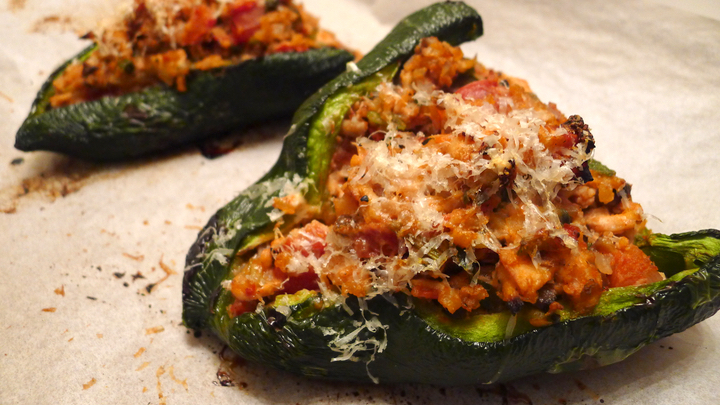 Bake for 25-30 minutes, or until the filling is golden brown and the peppers are softened. 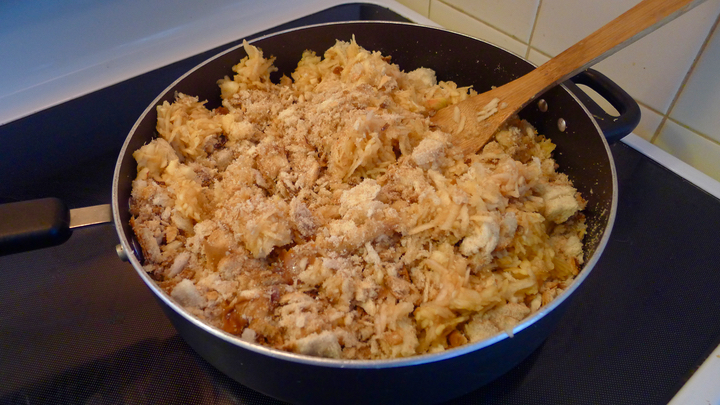 Remove from oven and add some additional Parmesan cheese on top. Enjoy! 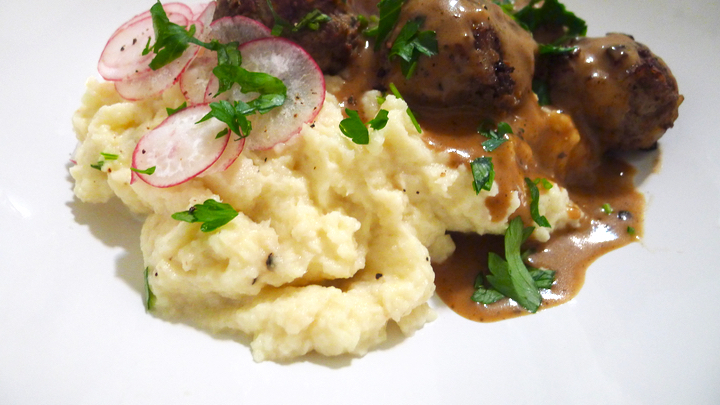 Another recipe I have never made before… Swedish meatballs! Super tasty and fairly easy to make. I saw some recipes that used cooked potato mixed into the meat, which I thought was interesting, so I tried it and thought it was a nice addition. The sauce is my favorite part, because you can smother everything with it… I’m a big fan of anything that involves a sauce like that. 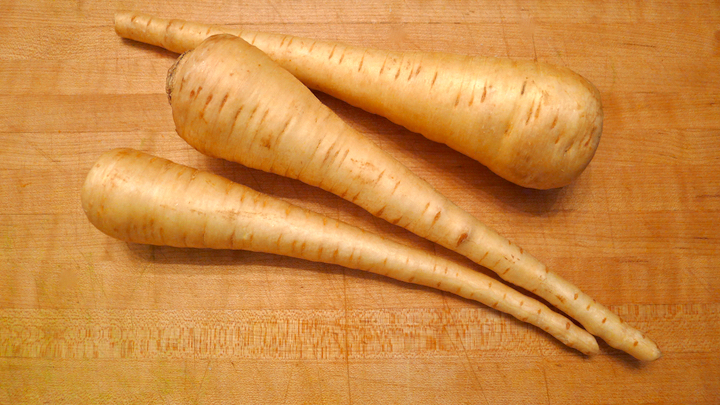 Originally I was going to make some mashed potatoes for the side, but decided parsnip mash would be a great alternative. 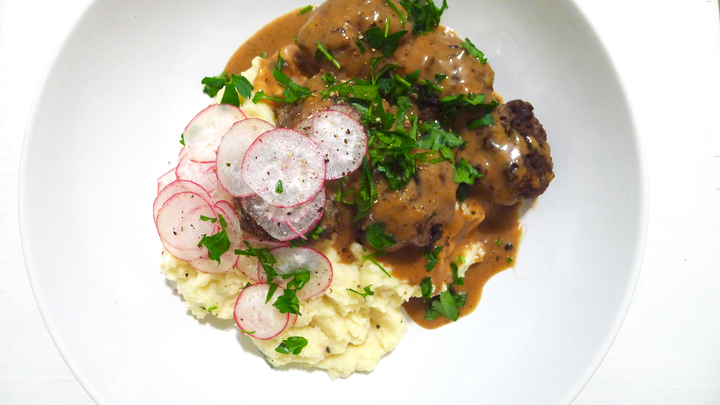 The sweetness of the parsnips with the meatballs and sauce was perfect. I will definitely be making this again! Bring a little saucepan of water to a boil, and cook the potato until fork tender. I chopped mine into large chunks so it would cook faster. 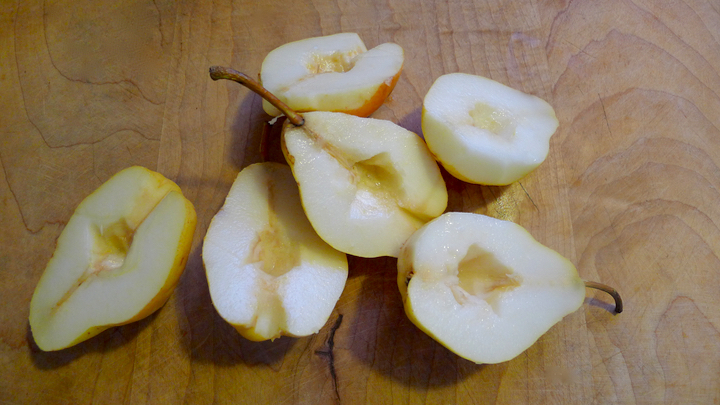 Let cool slightly then chop well into tiny pieces. 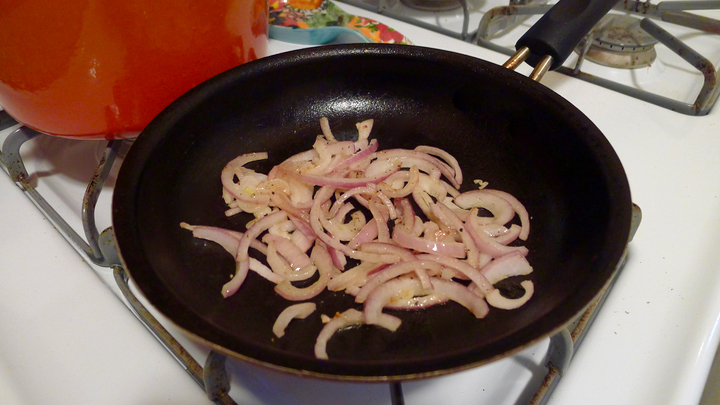 In a heavy bottomed skillet, saute the garlic and shallot in some olive oil until softened, about 2 minutes. 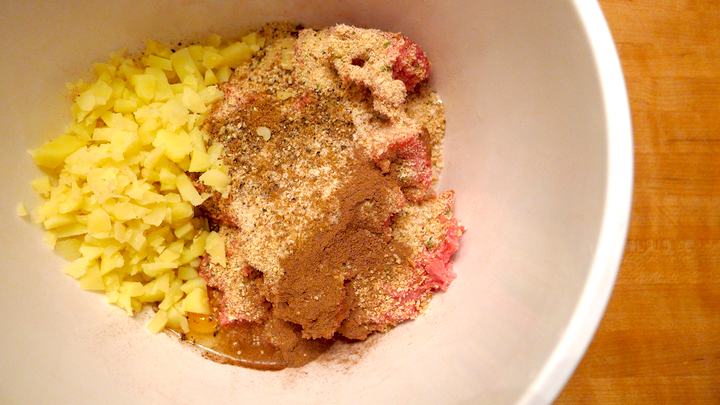 Add the potato and sauteed garlic/onion to a large bowl with the ground beef, bread crumbs, cardamom, all-spice, salt, pepper, and egg. 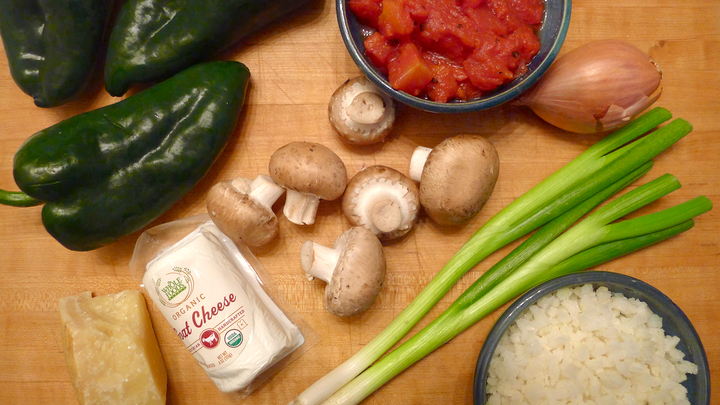 Mix well to incorporate all the ingredients. Shape into 1 inch balls and place on a plate. In a large skillet, add a tablespoon of butter and let melt over medium heat, swirling it around the pan. 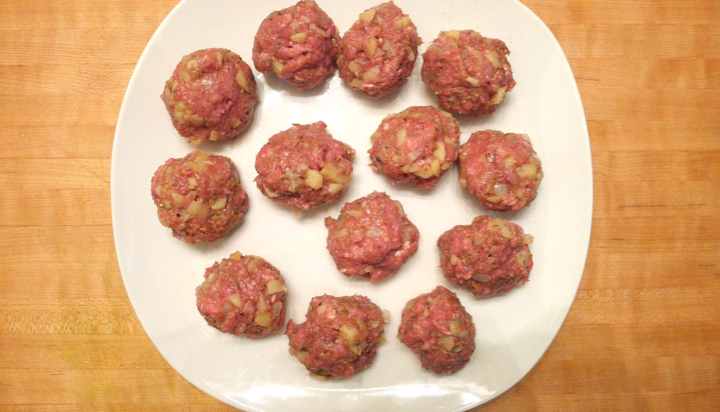 Add half of the meatballs and cook for about 7-10 minutes, or until cooked though. Keep in mind that they’ll continue to cook a little when you remove them from the pan. No one likes over-cooked meatballs! 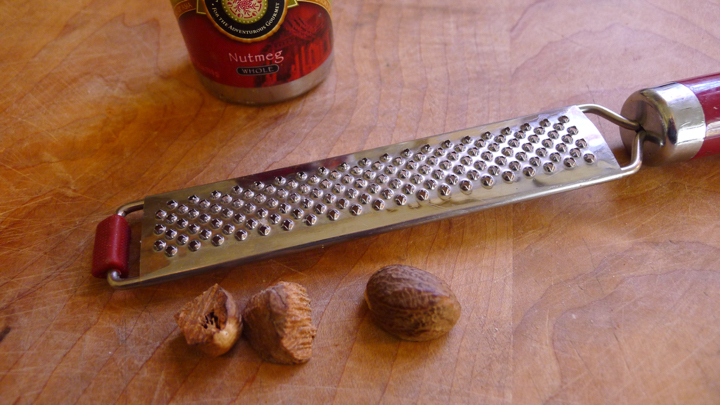 Remove and place on a plate, covering them with aluminum foil to keep them warm. 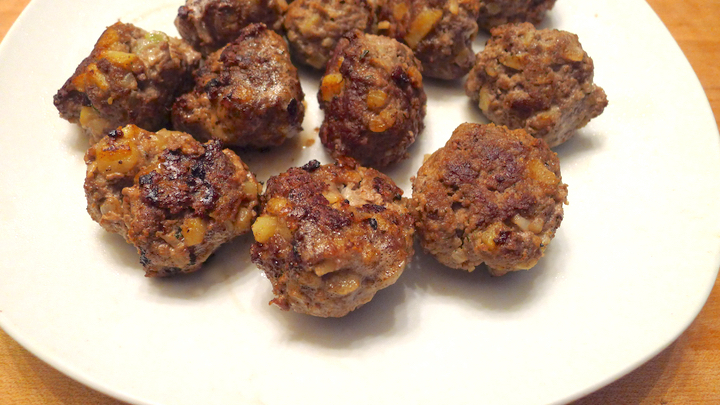 Repeat with another tablespoon of butter into the pan with the rest of the meatballs. 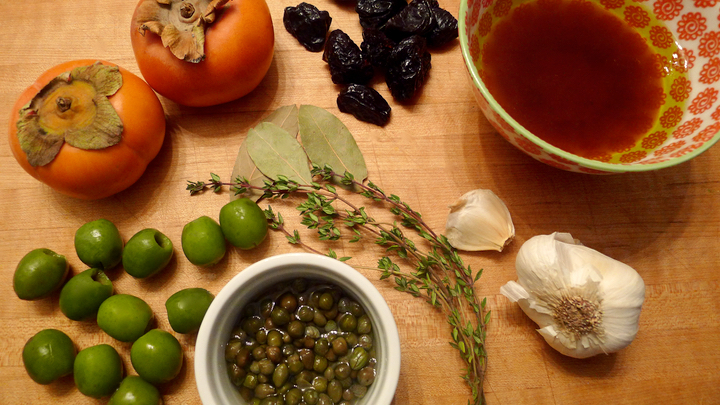 While the second batch of meatballs is cooking, get started on your sauce. 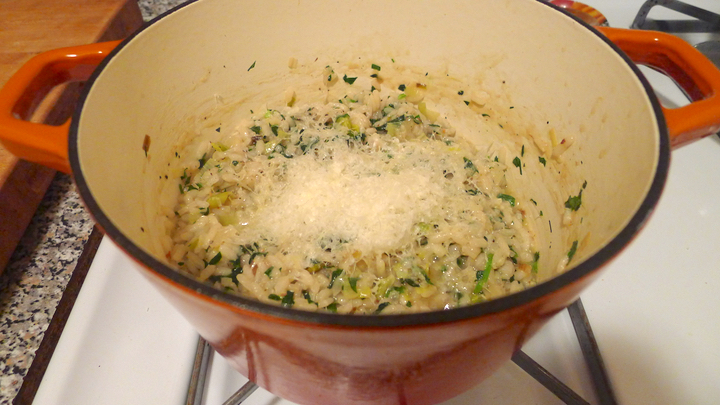 Using the same pan you cooked the garlic/shallots in, melt two tablespoons of butter over medium heat. Whisk in the flour and cook for 1-2 minutes, then slowly whisk in the beef broth to create a roux. Lastly, add the cream and sherry vinegar, then salt and pepper to taste. Let bring to a simmer and cook until the sauce thickens, about 8-10 minutes. At this point, you can either add the meatballs right to the sauce to coat them all, or you can plate and pour the sauce over top. Whichever you prefer! I made myself some parsnip mash to eat with the meatballs, if you’d like to make this as well just peel and chop the parsnips (3 large is enough for 2 people) then boil them until fork tender. Add a splash of half and half, a pad of butter, salt and pepper, then mash until smooth. 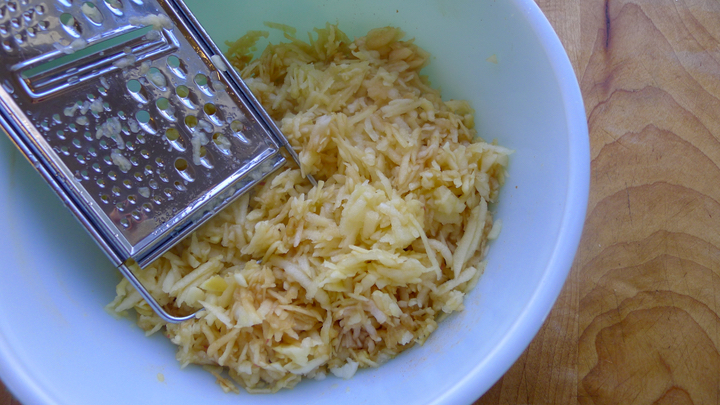 Alternatively, you can throw the parsnips/cream/butter/salt/pepper into the food processor to make them extra smooth! Risotto! It is so easy to make, and pretty much fail proof. 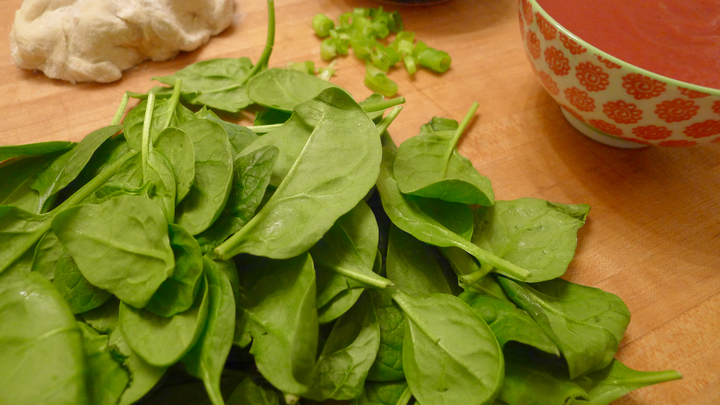 It is one of my go-to meals when I have a lot of veggies on hand and want something fairly quick and easy to make after a long day at work. 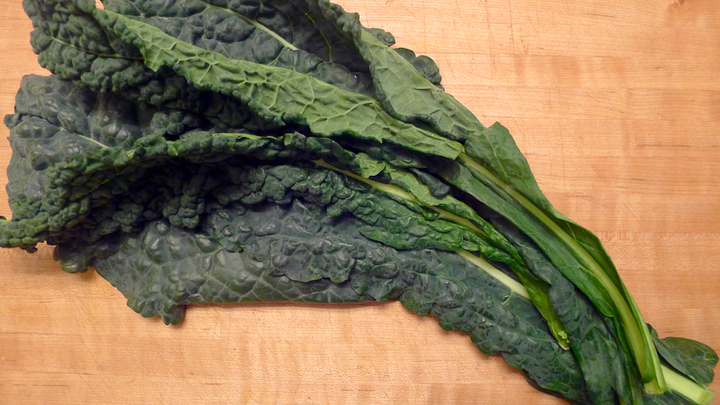 This week I used a mixture of kale, shallots, leeks, lemon, and Parmesan cheese – a little army of magical flavors. 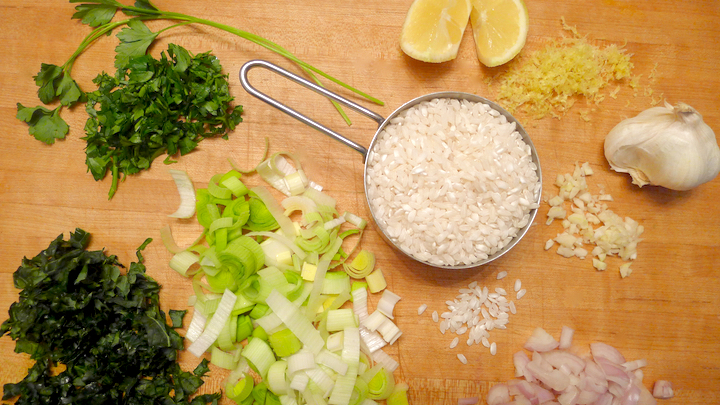 If you haven’t tried making risotto before, I recommend it! 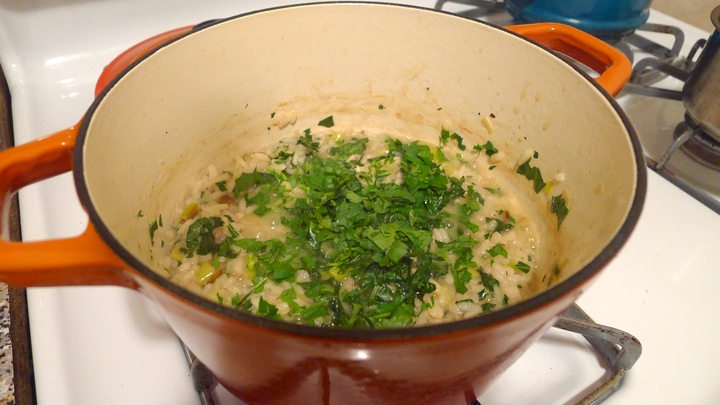 Start by bringing the chicken broth to a simmer in a medium saucepan. Keep on low. 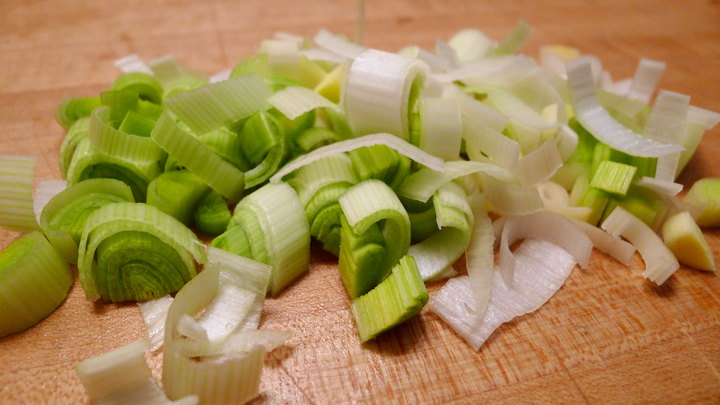 In a heavy saucepan, cook the garlic and shallot in some olive oil for a minute, then add the leeks and cook together until everything is softened, about 3-4 minutes. Add the rice and stir for another 1-2 minutes to toast the rice a little. 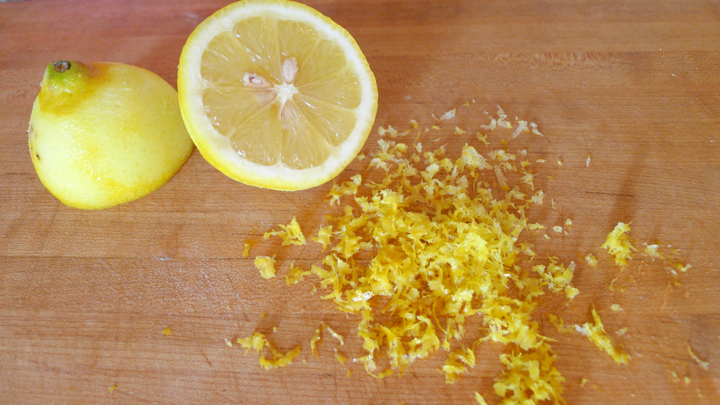 Next add the 1/2 cup of water, lemon juice, lemon zest, and the red pepper flakes. Cook and mix until liquid is absorbed. Now, start adding the chicken stock… you’ll want to add 1/2 cup of the hot chicken stock at a time, cooking until liquid is completely absorbed before adding your next 1/2 cup of stock. Repeat this until all the stock us used. It will take about 15 minutes or so. You want to be stirring constantly to move the rice around and help it from sticking to the bottom of the pan. 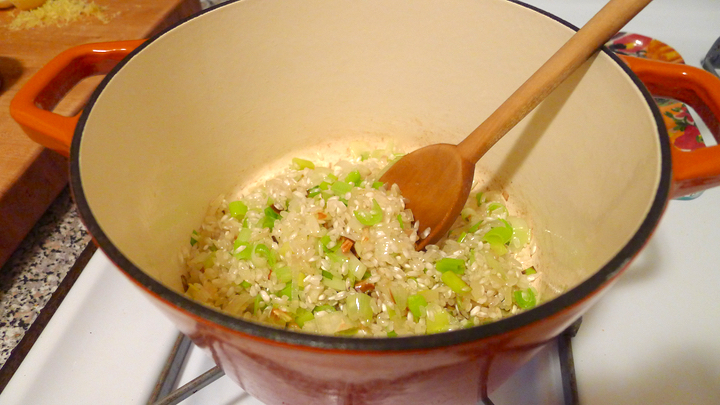 The rice will be soft but will still have a little firmness to it when finished. 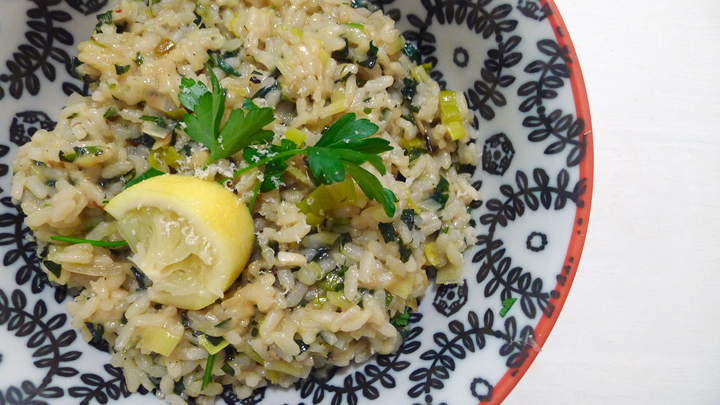 When the rice is about done, toss in the kale and parsley, then salt and pepper to taste. 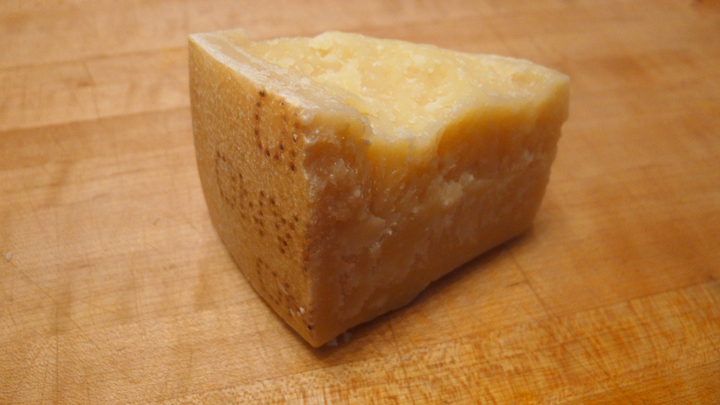 At the very end, fold in the Parmesan cheese. 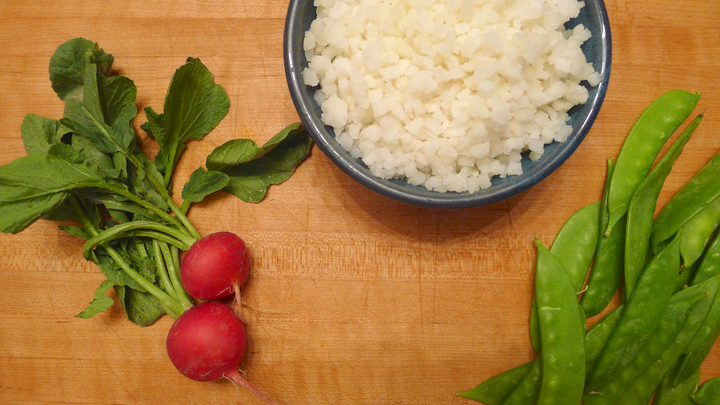 Risotto is a great side and goes with almost anything. I eat it as my main meal a lot too, and often top it with a poached egg. 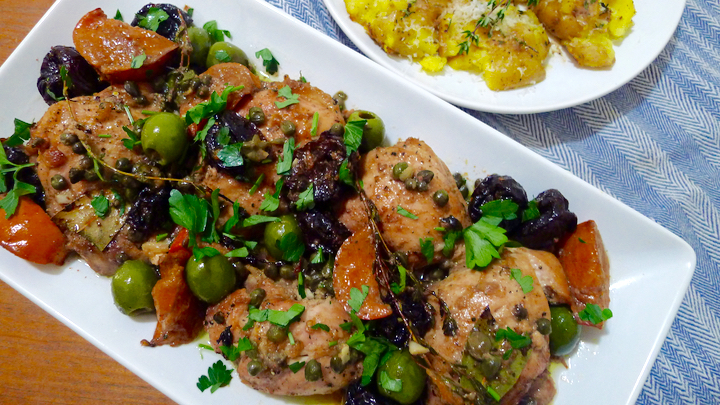 Holy Marbella… I didn’t even know Chicken Marbella existed until a few days ago, and it turns out it’s one of my favorite ways to eat chicken! 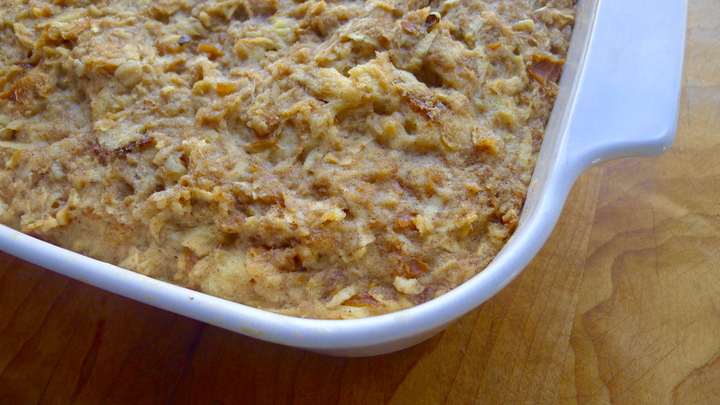 The recipe is originally from The Silver Palate Cookbook from 1982. 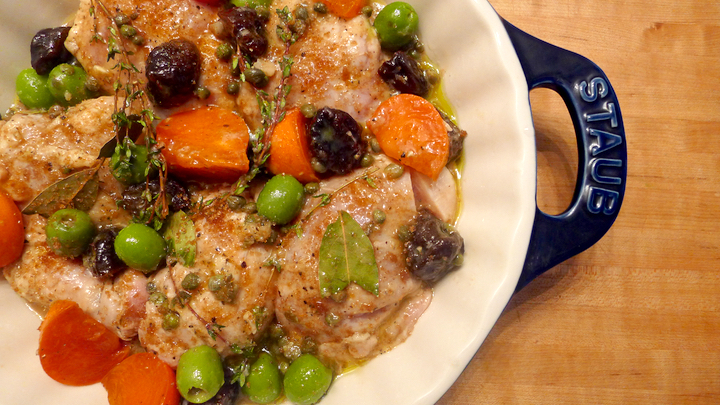 It’s cooked with capers, Spanish green olives, prunes, garlic, and fresh herbs. It’s packed with flavor and is the perfect mix of sweet and savory. It is also very easy to make! You just need to marinate it all together overnight, then plop it in the oven for about 50 mins the next day. I tweaked the originally recipe slightly by adding persimmons and fresh thyme, then omitting the white wine (because I didn’t have any on hand) and the dried oregano. I will definitely be making this recipe one million times in the future. 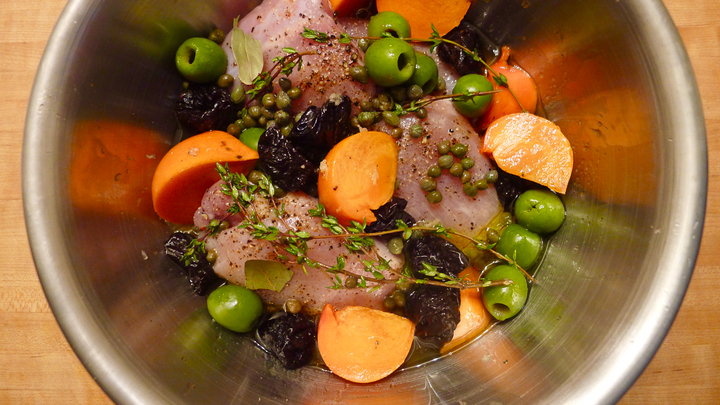 In a large bowl, toss together the chicken, olive oil, red wine vinegar, prunes, olives, capers and caper brine, persimmons, bay leaves, thyme, garlic, salt and pepper. Cover with plastic wrap and place in the fridge overnight, or longer is OK too, mine was marinating for a full day. Preheat oven to 350 degrees. In a shallow baking dish, arrange the chicken in a single layer then spoon the marinade evenly over the top. Sprinkle the top of the chicken pieces with the brown sugar. Place in oven for 50 minutes (or until chicken is cooked through) basting frequently with the pan juices. 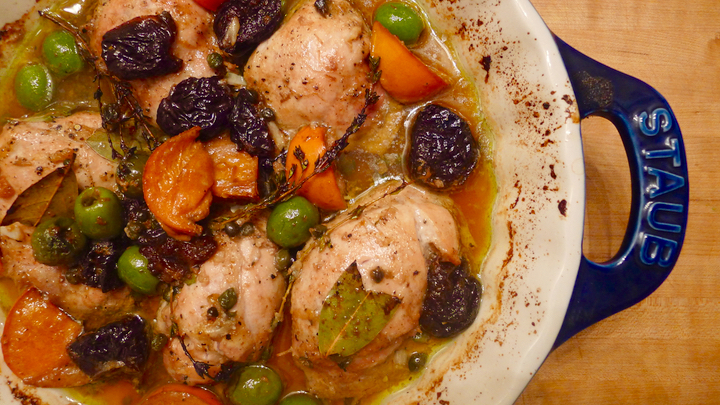 Remove from oven, then with a slotted spoon transfer the chicken and the toppings to a plate, and spoon over top some of the pan juices as well. 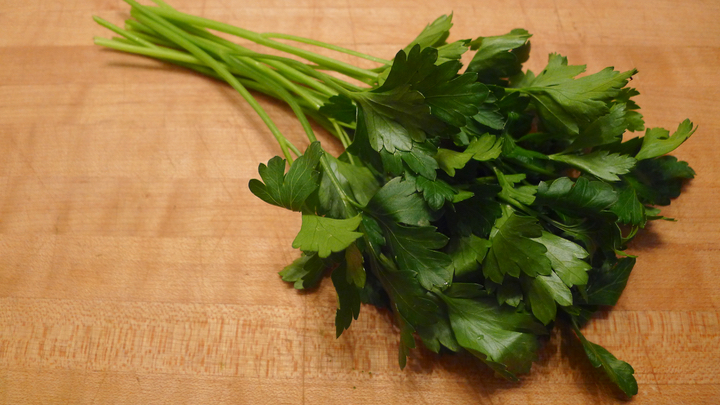 Sprinkle with fresh parsley and serve immediately. Save the rest of the pan juices and serve on the side for people to add more, if desired. 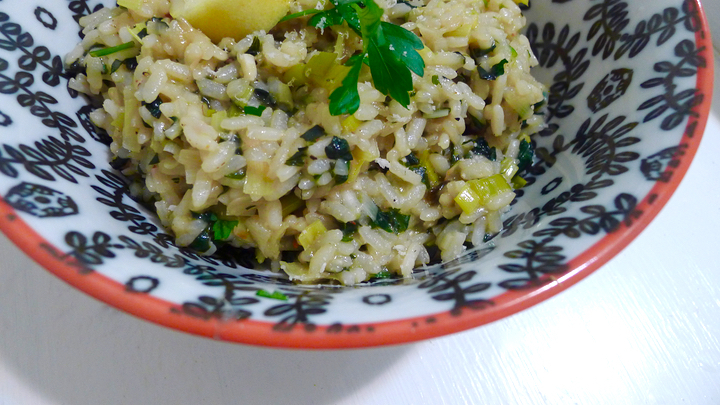 If you want to have a side, rice or polenta would be a nice option. I myself made some smashed fingerling potatoes then topped them with some Parmesan cheese, fresh thyme, and a drizzle of the pan juices from the chicken. On weekends I like to try and take a little time to make myself a nice breakfast, seeing weekdays it’s a grab and go type thing for me normally. 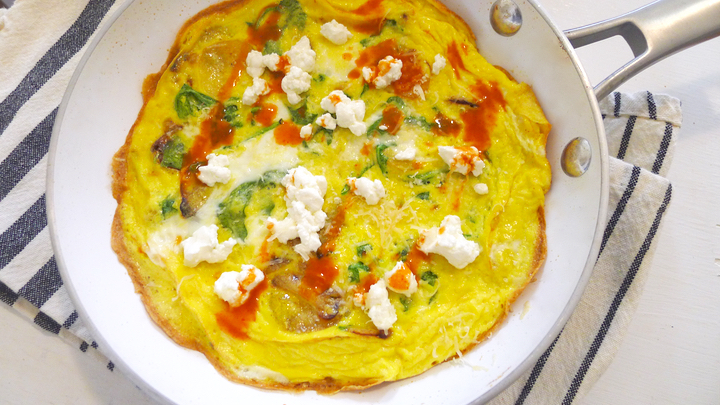 Last weekend I threw together a mini frittata, and it was DELICIOUS and so easy to make. 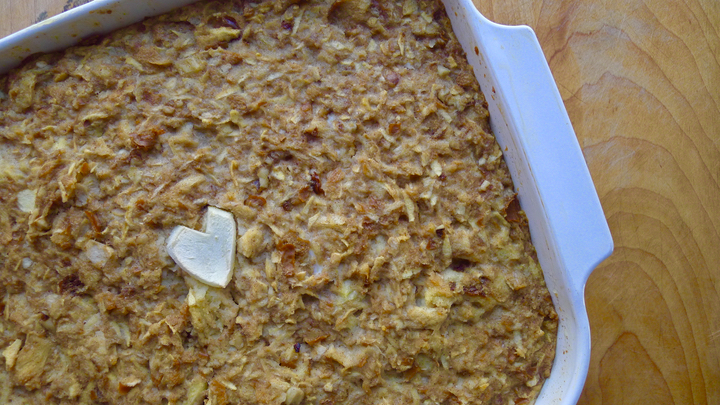 It all happens on the stovetop, with just a minute or so under the broiler to finish it off. Add some olive oil to your skillet and sauté the garlic, shallot, potatoes, red pepper flakes, and white pepper until the potatoes are cooked through. 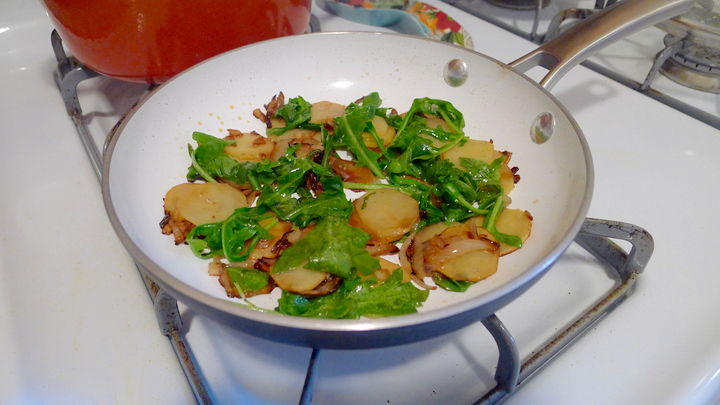 Add the arugula and cook until wilted. 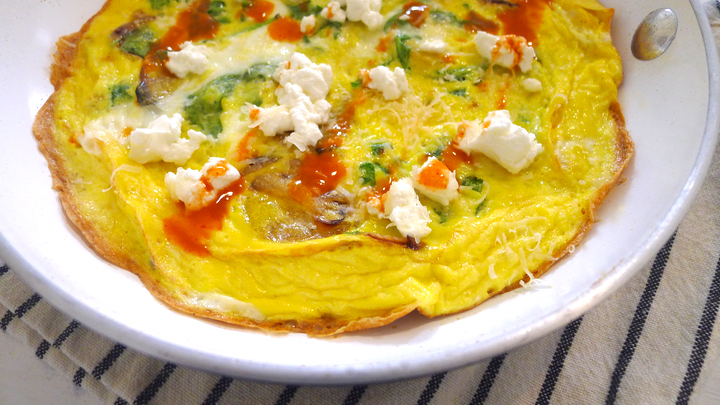 Top with half the Parmesan cheese, then pour in the eggs. 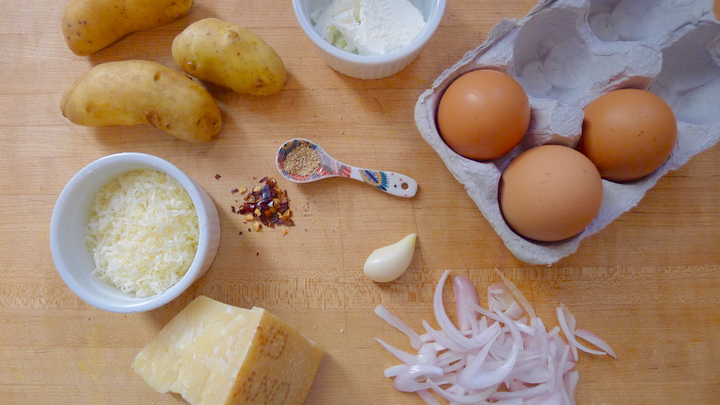 Top the eggs with the rest of the Parmesan cheese as well as the goat cheese. Cook over medium low heat, swirling the pan and lifting around the edges with a rubber spatula to allow the eggs to run under and disperse evenly. 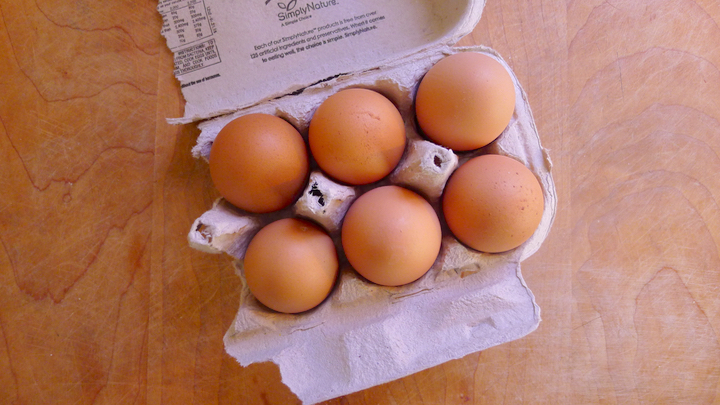 When the eggs are almost set, put the skillet under the broiler for 1-1/2 minutes to finish cooking the top of the eggs. Careful not to over cook though! Eggs always tend to cook a little past when you turn the heat off anyway, so I tend to cook them until a little soft then by the time they hit my plate they’ve continued cooking all the way, without overcooking them. 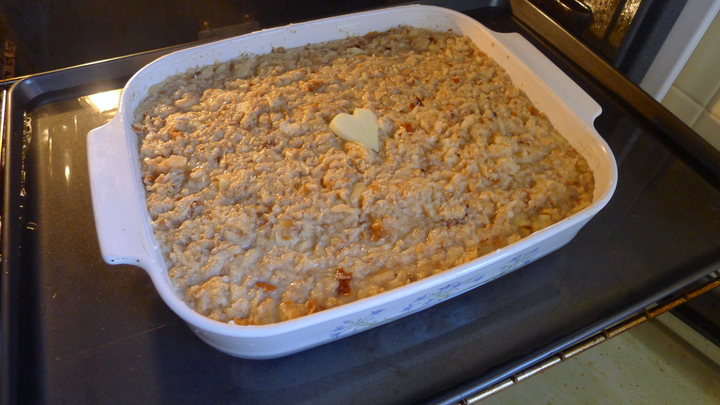 Another one of the family recipes that my mom shared with me while I was home last week. 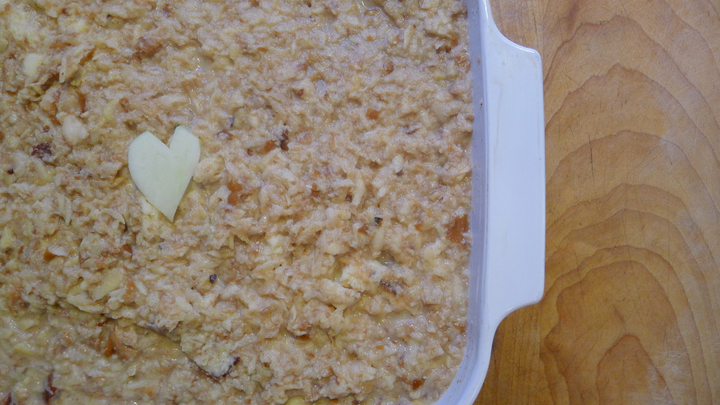 It is originally a recipe from my grandmother, then my mom added a few things like walnuts. 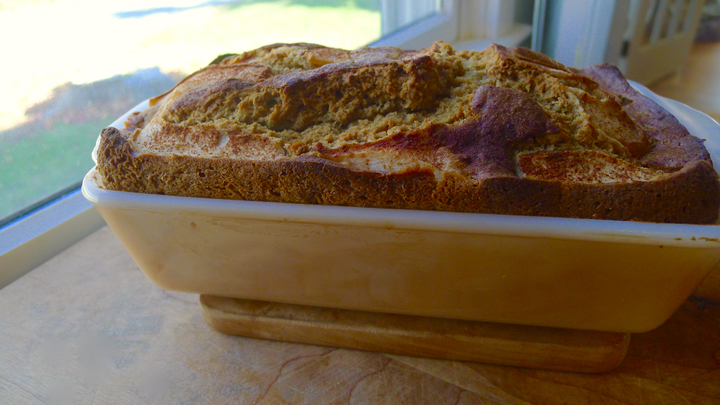 It’s such a comforting dessert, and tastes amazing right out of the oven with a bit of whipped cream on top. We ended up doubling the recipe to make a larger batch, but the recipe below is for the smaller amount, which serves about 4-5 people. Preheat oven to 375 degrees. 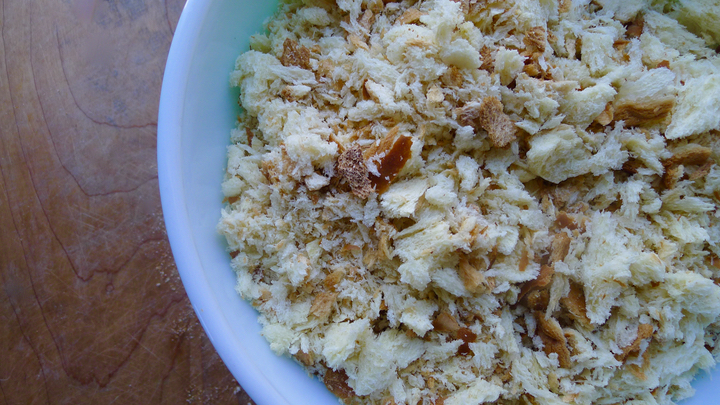 You can crumble the bread in a food processor or by hand. You want it to be crumbled but not too broken down that you have tiny breadcrumbs. 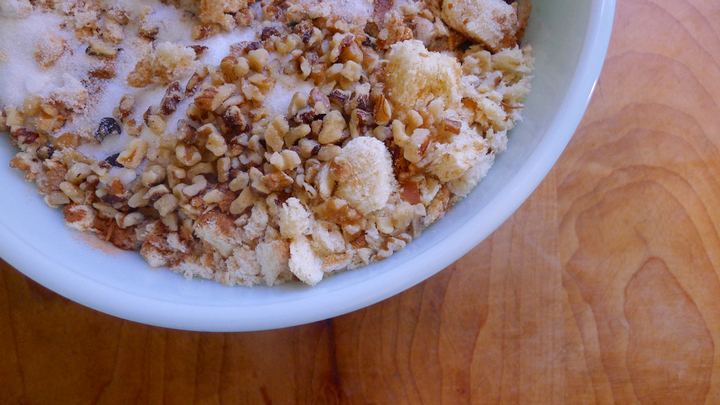 In a large bowl mix together the bread, apples, sugar, cinnamon, nutmeg, eggs, walnuts, and milk. Pour the mixture into a buttered casserole dish (alternatively, you can use coconut oil) then place the dish on a baking sheet, and fill the baking sheet with water to create a water bath. Bake for 45 minutes or until firm. Let cool slightly, then serve warm with whipped cream! 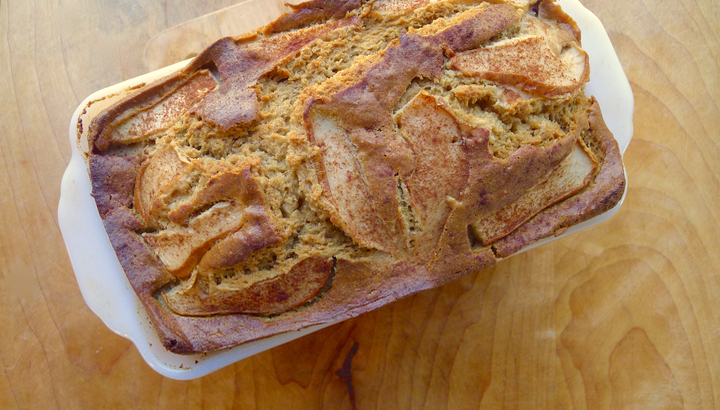 Nothing is more comforting than warm bread out of the oven covered in butter. Well, aside from anything covered in butter. 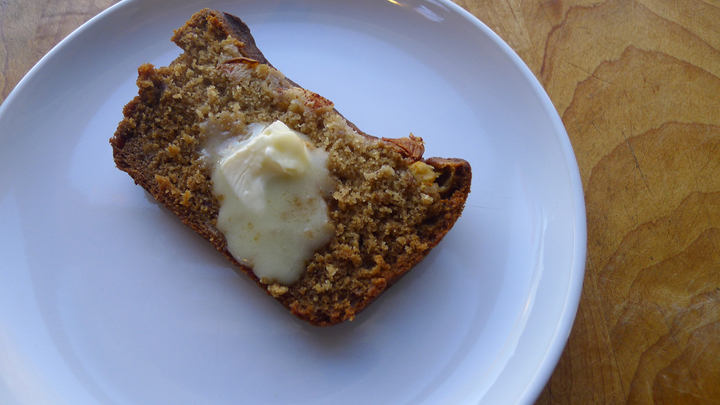 When I was home in Rhode Island last week, my mom shared a few recipes with me, one of them was this pear and vanilla bread – which is similar to banana bread but with pears instead. It couldn’t have been out of the oven for more than 2 minutes before we decided it was worth the risk of burning our taste buds off for an immediate first taste. SO worth it. 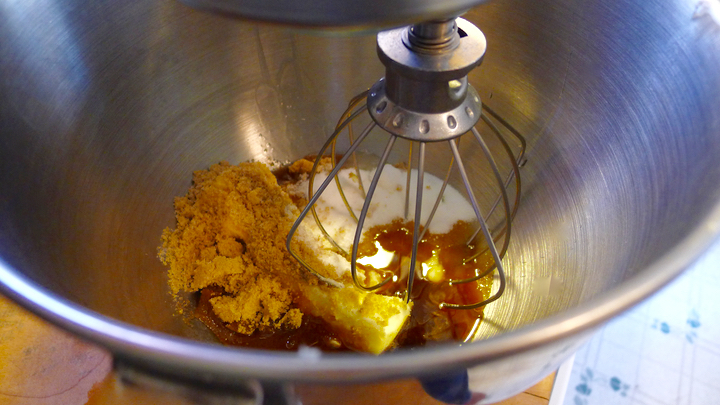 In a standing mixer, mix together the butter, brown sugar, eggs, and vanilla until smooth. 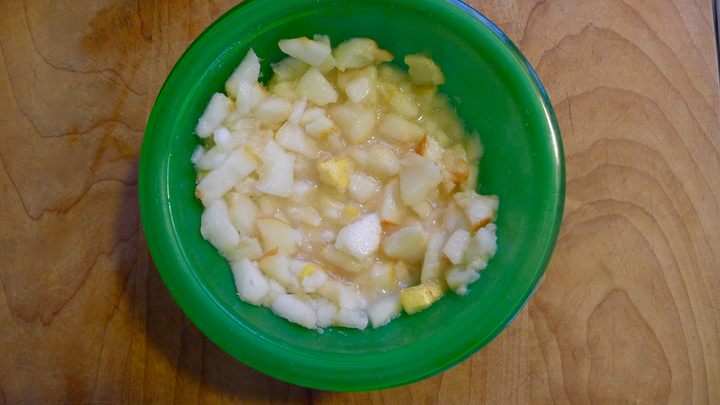 In a small bowl, smash the pears (don’t need to completely smash though) then add it to the butter mixture. 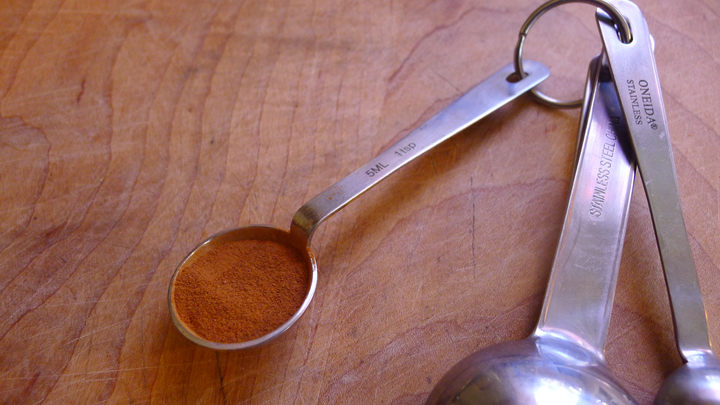 In another large bowl, whisk together the flour, baking powder, salt, cinnamon, and nutmeg. Add to the wet mixture and mix until well incorporated. 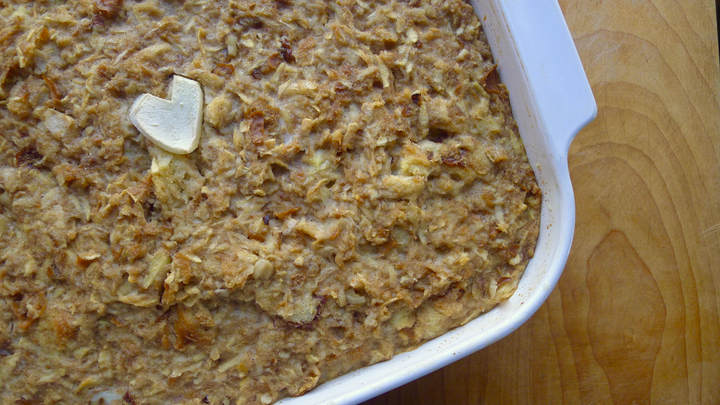 Pour mixture into a greased loaf pan, and bake for 45-1hr or until golden and an inserted toothpick comes out dry. 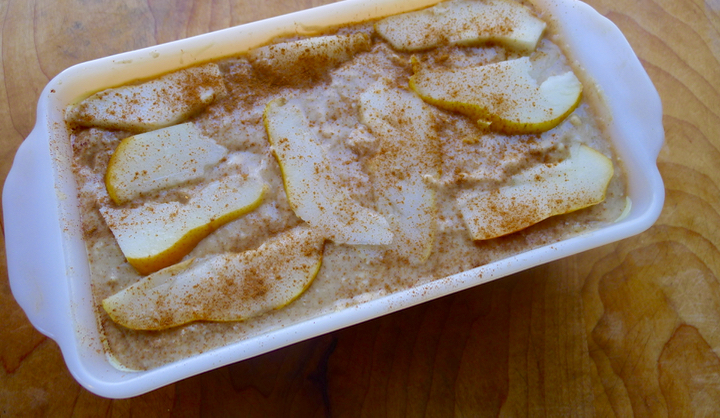 Let cool for a few minutes, then serve sliced with buttah! I woke up early today and couldn’t fall back asleep, so I got out of bed and made some homemade pizza dough. Because that’s what normal people do, right? I made enough so I could freeze a couple of individual batches to use in the future. 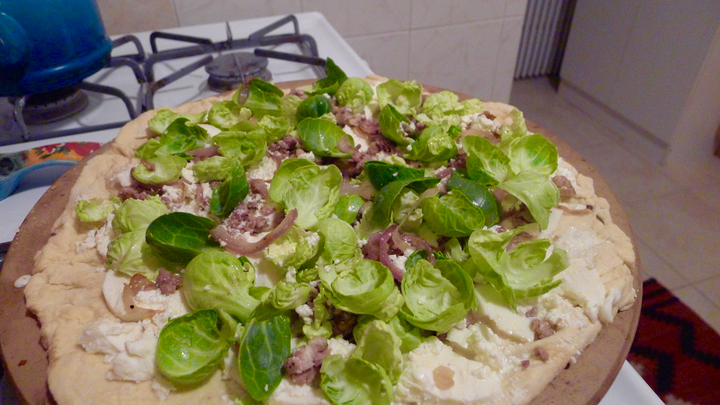 I had some Brussels sprouts, red onion, and Italian sausage on hand, so I decided to make a white pizza. 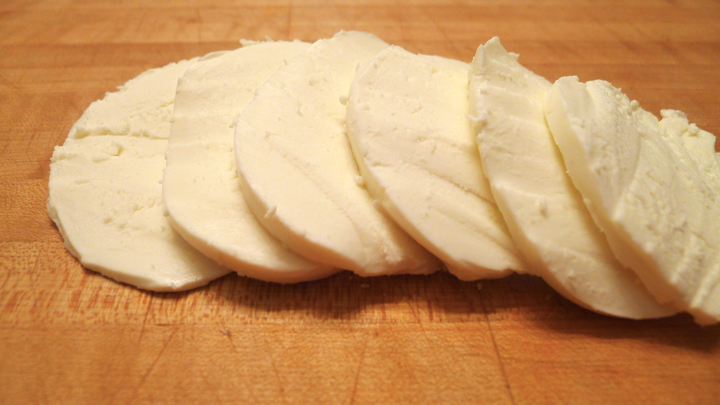 I used a mixture of mozzarella, ricotta, and Parmesan cheese… because there’s no such thing as too much cheese. Then I topped it with an egg at the end and BAM! Successful Sunday night dinner for one. If you’re in a pinch and don’t have the time to make your own dough, Whole Foods and Trader Joe’s sell some pre-made dough that I like. You can also stop into your local pizza shop and they’ll usually sell you a ball of dough for a dollar or two! 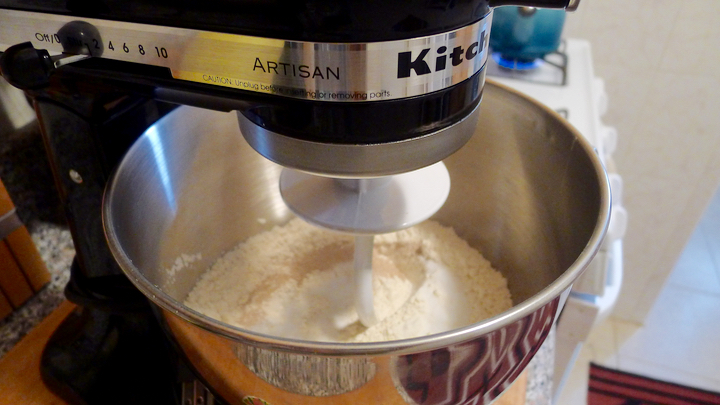 To make your own dough, start by placing the flour, sugar, salt, and yeast into the bowl of your standing mixer. Start mixing on the lowest speed, and gradually add in the warm water and 2 tablespoons olive oil. 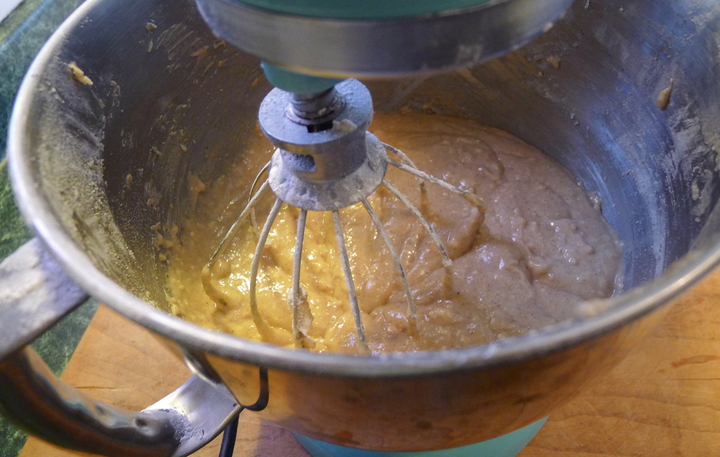 Let mix until the dough comes together into a ball. If it is looking too sticky, you can sprinkle in more flour. 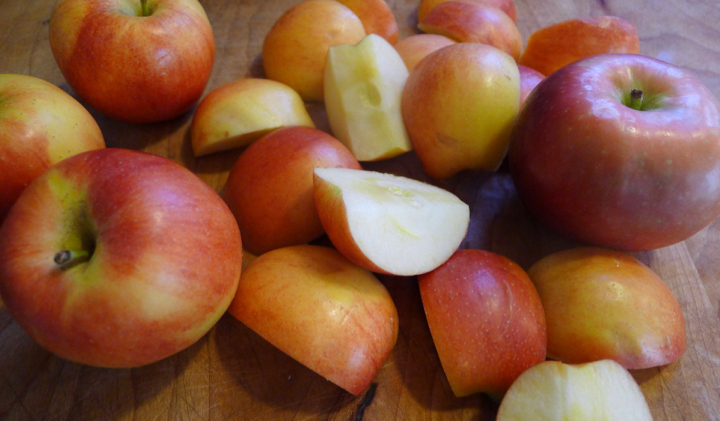 Alternatively, if it is looking too dry and flaky you can add a tablespoon of water. 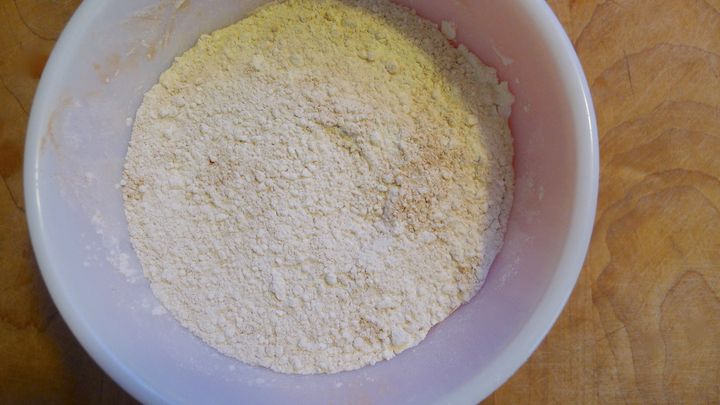 Turn the dough out onto a floured surface and knead with your hands a little to smooth it out, then form it into a ball and place it in a large lightly oiled bowl. Cover with saran wrap and let sir for 1 hour, allowing it to double in size. For me, this dough will usually make about 4 pizzas. I kept one out to use, and individually wrapped the others in saran wrap and placed them in a freezer-safe bag in the freezer to use a different day. Preheat oven to 500 degrees. If you’re using a pizza stone, place it in the oven now. If you’re planning to use a baking sheet, simply cover it with parchment paper. 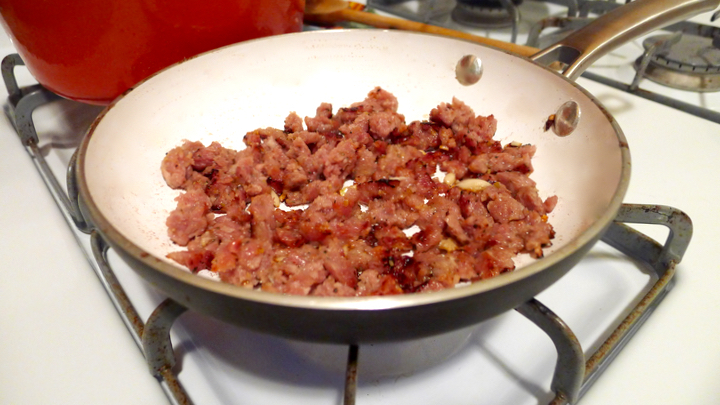 Sauté the sausage in a little olive oil until browned, then set aside. Pour out most of the oil, then cook your onions in the same pan. Also set that aside. 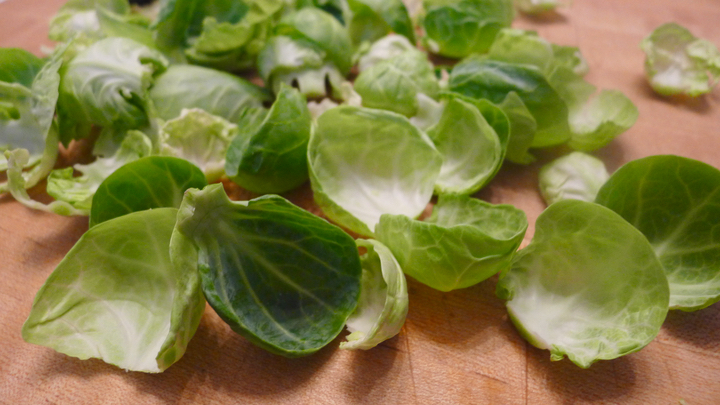 Lastly, quickly toss the Brussels sprouts in a little olive oil. 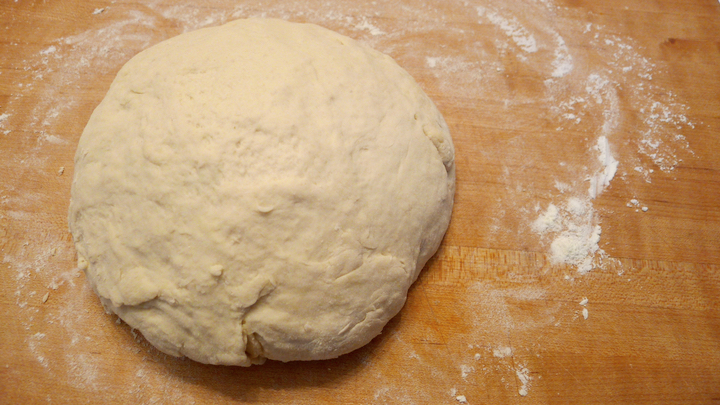 Roll out your dough on a floured surface. 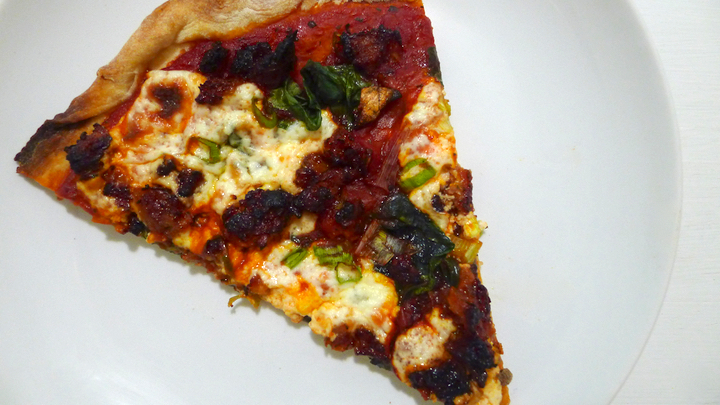 For me, I have a tough time getting my pizza onto the pizza stone after i’ve added all the topping, so what I like to do is remove the stone from the oven and quickly add the dough – but be careful because that little sucker is HOT. Moving fast, add the mozzarella slices, dollops of ricotta, crumbled sausage, red onion, and a small drizzle of olive oil. Place in oven and cook for 8-10 mins, or until it’s about 75% cooked. 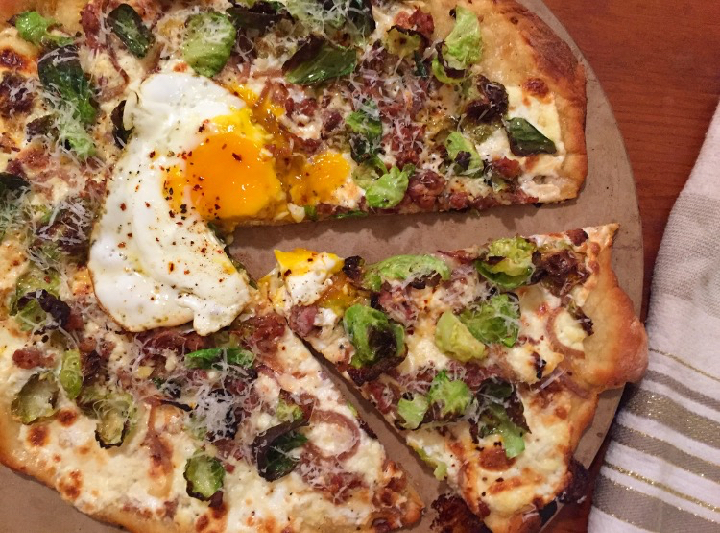 Remove from the oven and add the Brussels sprouts, then put back in the oven for another 7-10 minutes, or until the Brussels have crisped a little, the cheese is bubbling, and the crust/bottom of the pizza is golden brown. Remove from oven and place on a cutting board to cool for a minute. 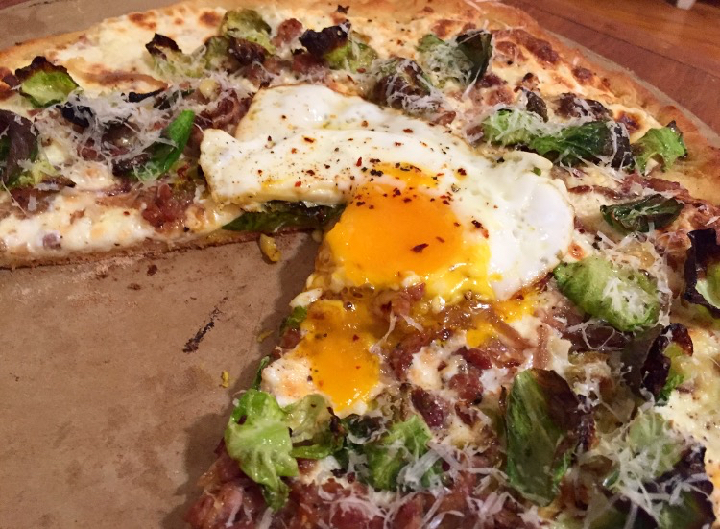 While it’s cooling cook up 1-2 sunny-side up eggs and place them on top of the pizza, then break the yolks to let them run. Top with fresh grated Parmesan cheese, black pepper, and red pepper flakes. Enjoy!